This pattern is provided on the Lion Brand Yarn website along with many other free patterns which range from "easy" to "advanced". The site is an excellent source of a vast variety of knit and crochet projects. GAUGE: 11 sc = 4 in. (10 cm) BE SURE TO CHECK YOUR GAUGE. When you match the gauge in a pattern, your project will be the size specified in the pattern and the materials specified in the pattern will be sufficient. If it takes you fewer stitches and rows to make a 4 in. [10 cm] square, try using a smaller size hook or needles; if more stitches and rows, try a larger size hook or needles. STITCH EXPLANATION: Sc2tog (decrease) (Insert hook into next st and draw up a loop) twice. Yarn over and draw through all 3 loops on hook. NOTES:Rnds are worked in continuous spirals; do not join and do not turn. Place marker to indicate beg of rnd. Rnd 1: Work 6 sc in first ch. Place marker in first stitch for beginning of rnd, move marker up each rnd. Rnd 2: Work 2 sc in each st around –12 sc. Rnd 3: *Work 2 sc in next st, sc in next st, rep from *around –18 sc. Rnd 4: *2 sc in next st, sc in each of next 2 sts, rep from * around –24 sc. Rnd 5: *2 sc in next st, sc in each of next 3 sts, rep from * around – 30 sc. Rnd 6: *2 sc in next st, sc in each of next 4 sts, rep from * around – 36 sc. Rnds 7-14: Sc in each st around – 36 sc. Rnd 15: *Sc2tog, sc in each of next 4 sts, rep from * around – 30 sc. Rnd 16: *Sc2tog, sc in each of next 3 sts, rep from * around – 24 sc. Rnd 17: *Sc2tog, sc in each of next 2 sts, rep from * around – 18 sc. Rnds 1-3: Rep Rnds 1-3 of Head–18 sc. Rnds 4 and 5: Sc in each st around. Rnds 1-6: Rep Rnds 1-6 of Head–36 sc. Rnd 7: *2 sc in st, sc in each of next 5 sts, rep from * around–42 sc. Rnds 8 -17: Sc in each st around. Rnd 18: Sc2tog, sc in each of next 17 sts, (sc2tog) twice, sc in each of next 17 sts, sc2tog–38 sc. Rnd 19: Sc2tog, sc in each of next 15 sts, (sc2tog) twice, sc in each of next 15 sts, sc2tog–34 sc. Rnd 20: Sc2tog, sc in each of next 13 sts, (sc2tog) twice, sc in each of next 13 sts, sc2tog–30 sc. Rnd 21: Sc2tog, sc in each of next 11 sts, (sc2tog) twice, sc in each of next 11 sts, sc2tog–26 sc. Rnd 22: Sc2tog, sc in each of next 9 sts, (sc2tog) twice, sc in each of next 9 sts, sc2tog–22 sc. Rnd 23: Sc2tog, sc in each of next 7 sts, (sc2tog) twice, sc in each of next 7 sts, sc2tog–18 sc. Rnd 4: Sc in each st around–18 sc. Rnd 5: Sc in each of next 8 sts, 2 sc in each of next 2 sts, sc in each of next 8 sts–20 sc. Rnd 6: Sc in each of next 8 sts, (sc2tog) twice, sc in each of next 8 sts–18 sc. Rnd 7: Sc in each of next 7 sts, (sc2tog) twice, sc in each of next 7 sts–16 sc. Rnd 8: Sc in each of next 6 sts, (sc2tog) twice, sc in each of next 6 sts–14 sc. Rnds 9-15: Sc in each st around. Rnds 1-3: Rep Rnds 1-3 of Head. Rnds 5-7: Sc in each st around. Rnd 8: Sc in each of next 10 sts, (sc2tog) twice, sc in each of next 10 sts–22 sc. Rnd 9: Sc in each of next 9 sts, (sc2tog) twice, sc in each of next 9 sts–20 sc. Rnd 10: Sc in each of next 8 sts, (sc2tog) twice, sc in each of next 8 sts–18 sc. Rnds 11-18: Sc in each st around. Rnd 6: *Sc2tog, sc in next st, rep from * around–12 sc. Row 1: Sc in 2nd ch from hook and each ch across–70 sc. Rnd 2: *2 sc in next st, sc in next st, rep from * around in the next stitch* rep from around–9 sc. Rnds 3 and 4: Sc in each st around. Rnd 5: *Sc2tog, sc in next stitch* rep from around–6 sc. Fasten off, leaving a long tail. Stuff Pompom and use tail to stitch closed. Following package directions, attach Safety eyes onto Head. Lightly stuff Head. With black yarn and following photograph, embroider nose detail onto Nose. Lightly stuff Nose and sew to Head. Sew on Ears. Stuff Body, sew Head onto Body. Stuff Arms and Legs and sew to Body. Sew Pompoms to ends of Scarf, tie Scarf onto Bear. Weave in ends. Wow! I love that! I'm here from the free hot samples blog hop! They are adorable! I love how you can make them any color to match your decor too. Thanks for sharing and thanks for linking up to Making Your Home Sing Monday! They are so cute. Happy Blue Monday. I love that web site~ I can always find a new project to keep me busy. Those little teddies are so snuggly! Wow, how sweet those are! I esp. love the crocheted neck bows. You are so talented. I always love a teddy bear. These are adorable! Great job! I wish I have your talents. Tried my hand at crochet before, didn't work for me. WOW! You are so talented. What a wonderful gift for those who love to crochet. These are so cute! A friend tried to teach me how to crochet & I could NOT get the hang of it...She made it look so easy!!! 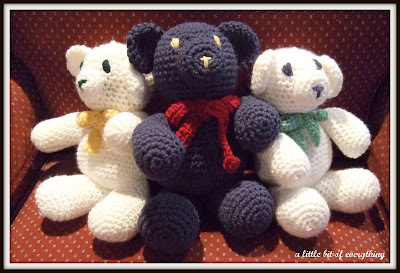 OK I'm going to have to learn how to crochet, these are darling! Hey! Found you off of White Wednesday! The little bears as so cute. Lately, I haven't been able to crochet too many bears or amigurumi (I love Amigurumi and Thread Bears the most), but these guys are super inspiring, and make me think I should start crocheting more creatures for my little menagerie. Great post! These are adorable! I so wish I could crochet! A lot of people say you either knot or crochet and you can't do both. I guess I'm a knitter because crochet has not been my friend! Ok, I am very jealous here. I bought a battern for a tiny bear, bought some beautiful thread and new needle. I don't know, my glasses, the light, I couldn't even count to 10 and make it work. I want to learn this so bad. I sure do hope you'll link them up to Fibers on friday, too! They're so cute! I can't let my daughter see them, she's begging me to knit her a teddy bear. Truth be told, I just don't wanna!!! And I know she just wants one so that THEN she can ask me to knit the bear sweaters that she can take on and off!! SO CUTE! that is a craft I need and want to learn! thanks for sharing! Super Cute! I am trying to teach myself to crochet. But I don't think I will ever be that good. Too cute! My daughter just asked me if I could knit her a bear; but then like Beth in the comment before me, she'll want me to knit sweaters and dresses for it ... It's just like the "If you give a mouse a cookie ..." story. Hope you can stop by for a visit. Following you. I like the Lion Brand Yarn website too. and I also like the Pattons yarn website. I'm making a scarf right now - pretty basic. It has 2 yarns, 1 side solid and 1 side in a pattern yarn - all sc. It turns out really pretty. I'm following you now and I'd love to have you visit my blogs sometime. Tina "The Book lady"
What adorable little bears! They must have taken FOREVER to make! Oh, my mom used to make these for a craft fair to raise money for T.O.P.S. (Take Off Pounds Sensibly). I thought of her as soon as I saw this picture! Stopping by from Over 40. CUTE! I'm working on a crochet turtle right now. Your look very nice. Thanks for linking up to Topsy Turvy Tuesday's. Who does not love a teddy bear! So cute!